Christian prayer is rooted in the revelatory Word of God. We hear the voice of God addressed to us and to the Church through the Holy Scriptures. As we receive this Word from God, the heart of faith desires to respond. It is out of this receiving of God’s Word and the desire to respond, that the conversation with God, which is prayer, happens. The ancient form of structured prayer through the day, often called the Daily Office and the Liturgy of the Hours, is not simply a vehicle by which Christians are brought to prayer, rather it is a tool developed by the Church to instruct us in prayer and faith, and a means to keep our conversation with God rooted in His Word. Praying at appointed times during the day can be traced back to the Old Testament practice of praying at fixed hours of the day. God commanded the Israelite priests to offer morning and evening sacrifices (Exodus 29:38-39, Exodus 30:6-8). Psalm 1:2 instructs: “but his delight is in the law of the LORD, and on his law he meditates day and night.” When sacrifices were outlawed during Israel’s forced exile in Babylon prayer services were developed in the synagogues as sacrifices of praise. Upon the return of the Jewish people to judea, those prayer services were brought into the Temple. In addition to the prayers accompanying ht morning and evening sacrifices, there was prayer at the third, sixth, and ninth hours of the day (Psalm 119:164). Much evidence suggests that this structured schedule of prayers, a feature of liturgical life at the time of Christ, was passed on as a legacy to the Early Church, providing the form, if not the content, for the daily prayers. The chief purpose for the practice of the Daily Office is the sanctification and marking of time. “Therefore stay awake—for you do not know when the master of the house will come, in the evening, or at midnight, or when the rooster crows, or in the morning— lest he come suddenly and find you asleep. And what I say to you I say to all: Stay awake.” (Mark 13:35-37). In the ancient world, the time between dawn and dusk was divided at recognized pints–the third, sixth, and ninth hours–and Christians found it natural to mark the passing of the day with prayer at these times. For the most part, these daytime prayers were private or family payers within the home. By the middle of the third century, the hours of prayer had become commemorations of the work of Christ: daybreak celebrated the resurrection; the third hour, the dondemnation of the Christ; the sixth hour, the curcifixion; the ninth hour, Jesus’ death; evening, the rest in the tomb or the light of Christ in the darkness of the world. With this development, it became common for the Liturgy of the Hours to be prayed by the congregation gathered together for this purpose. Over time, these offices became increasingly elaborate as they became the exclusive property of the monastic communities, since the chief vocation of the monks was that of prayer. During the Middle Ages, an elaborate system of canonical hours (scheduled prayers ordered by Roman Catholic canon law) was prescribed as part of the monastic vocations and the various orders of the clergy. Reforms of the schedule and content of the Daily Office have occurred throughout the centuries since the Reformation, most notably by the Lutherans and the Anglicans. Both communities greatly simplified the Daily Office; for example, the midnight Office of Matins was aggregated with Lauds. A slightly later development often omitted Prime and celebrated the aggregated Matins/Laudes as the sole early morning prayer service called Matins, or Morning Prayer. Vespers and Compline were blended int a single evening service called Vespers or Evensong. The Anglicans and the Lutherans ultimately took different approaches to the reform of the Daily Office. Under the Anglican reforms, the offices retained an essentially monastic character: all 150 psalms are appointed to be read during the course of a month, nearly the entire Bible is read throughout each year, and the preists in the Church of England are required to read Morning and Evening Prayer daily, in their parish churches if possible. Martin Luther took Matins and Vespers out of the monastery and formulated these two prayer services for congregational use. While both services focus on praise and reflection on Scripture, Luther’s modifications made Matins and Vespers ideal “preaching services.” Lutherans have seldom felt compelled to use all 150 psalms within a prescribed period of time nor is it appointed that they read the whole Bible each year in the course of these services. As a result, though the rhythm of “daily” prayer (sunrise to sunset) is present, Matins and Vespers as preaching services tend to offer a stronger emphasis on the progress of the Church Year as the propers of Sundays and the seasons of the Church Year are used in the services and in the sermon. Among Lutherans the other daytime prayer offices were almost completely lost. In recent generations, the venerable but often ignored forms of prayer have been increasingly recognized as going to the heart of Christian faith and piety–teaching the Church the meaning and practice of prayer. The offices–whether only Morning and Evening Prayer or the inclusion of other daytime prayer offices–not only give us the words and forms for our prayer but also invest the hours of the day with devotional significance, teach us through the Word, and give our experience of time context of eternity. The whole Church on earth participates in a service of praise to our God. New congregations of God’s people take up the unending song when others find their day’s, or life’s, work at an end. So the prayer of the Church goes on, hour by hour, around the world and from generation to generation in an unbroken cycle of praise. The Daily Office is not restricted to gatherings in church buildings. By their very nature the prayer offices are personal and meditative. Individuals and households can organize their daily prayers in the pattern of the of the Daily Office. For example, if you currently pray at one time during the day, perhaps individually or with the family in the evening, consider adding Matins or Morning Prayer after breakfast or during you morning break. If you typically pray in the morning, add Vespers or Evening Prayer as a conclusion to your family dinner. 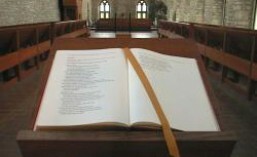 In such a prayer structure, the Psalmody and Old Testament reading appointed in the Treasury can be used in the morning, and the New Testament reading and the appointed Another simple addition to your personal prayer schedule is Compline, a brief office designed for use before bedtime, even at one’s bedside, to bring the day to a quiet close. It draws the parallel between slee at night and sleep in death. Teh same security we hae in the promises of god for our eternal well-being are ours as we prepare for our rest at night. Compline takes no more than fifteen or twenty minutes and settles your mind and heart as you focus on God’s Word and His promise of peace and protection. Compline just before going to bed. Close of the Day just before going to bed. Many who take up the discipline of the Daily Office can end up feeling guilty when a particular Hour has not been prayed. Some, in fact, will then try to “catch up” what was missed, even to the point of gluing a number of Hours together and praying them one after the other. This reaction is borne of an individualistic understanding of Christianity whereby individuals join the church for mutual support of individual spiritual growth. The Scriptural understanding of the Church is that it is Christ’s body, in that perspective, the Church exists prior to individuals joining it. Individuals become Christians precisely through their incorporation into this community through baptism. The Daily Office is not an individualistic endeavor. Instead it is the way an individual participates in the prayer of the community, the Church. Thus, one does not need to feel burdened to participate in a particular office every day, or feel guilty when a time is missed. Rather, when you miss a time you typically set aside for prayer, be conscious that the prayer goes on as the people of God throughout the world call on their dear Father — you do not catch up with it, rather you join the ongoing prayer again when you can. If you decide to use the Daily Office as a whole or in any part, it is helpful to put time limits on when a particular office is prayed. If, for example, your discipline is to pray the primary hours of Matins/Morning Prayer, Vespers, and Compline, you might decide that you do not pray Matins after 10 a.m. If you miss the time window, you pick up the discipline again with the next office. In these matters there are no laws; rather there is the freedom in the Gospel to use or not to use the offices according to one’s needs and personal piety. The pattern of prayer according to the Office may also be used for a season in one’s spiritual life. For example, the Daily Office may deepen the observance of Holy Week, or enrich a time of reflection or repentance such as the Ember Days. The Daily Office can also serve to focus your mind and heart on God as you go through the personal “seasons” of life. Times of distress, stress, tragedy, and illness may be become times of spiritual renewal and strengthened faith through the deliberate conversations with God provided by the Daily Office. 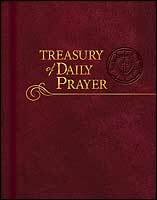 This entry was posted in Christian Church Year, Treasury of Daily Prayer and tagged Christian life, Daily Office, Liturgy of the Hours, prayer, Worship. Bookmark the permalink.